Some of you may not be aware that I have a free Johnny Reb 3 regimental-level wargaming scenario posted on-line on my wargaming website. It is for the July 3 morning attack on Culp’s Hill, particularly the action in what later became known as Pardee Field. The scenario has been played many times at conventions and gaming clubs, and is fairly even in terms of which side will win. If anyone out in cyberland has regimental level scenarios you want to share, please send them to me. A few years ago, I created a 15mm model of parts of the battlefields of South Mountain, a now rather obscure part of the Maryland Campaign. Approximately 240,000 visitors a year tramp the nearby battlefield of Antietam (and more than a million tour Gettysburg), but a fraction ever take time to visit South Mountain, where D.H. Hill’s men delayed much of George B. McClellan’s Army of the Potomac for an entire day, giving time for Robert E. Lee to concentrate his forces and select ground for a defense. 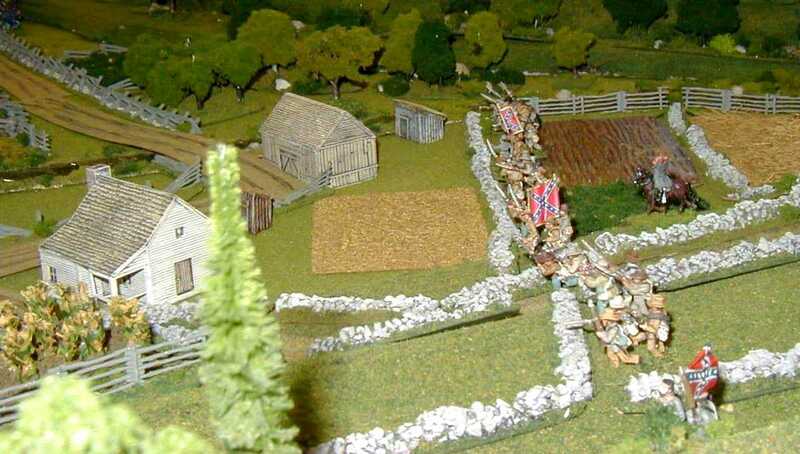 I created the 15mm layout for a wargame I did at the Rutherford B. Hayes Presidential Center and Library in Fremont, Ohio, and then replayed the game at various wargaming conventions (Hayes was wounded on South Mountain leading the 23rd Ohio Volunteer Infantry up the slope near Fox’s Gap). Click to see several photos of my finished layout as the Rebels (Garland’s Brigade and others) struggle to defend the area around Fox’s Gap and the lower approach to Turner’s Gap (Colquitt’s Brigade). The Iron Brigade is just off the last picture to the left, heading for the Georgians. The good folks at Osprey Press have released an interesting new addition to their Elite series (Volume 161), The US Home Front 1941-45. Written by Florida-based Alejandro de Quesada, this book explores the major activities in America while the troops were overseas. It is useful as a broad look at the home front, and will whet the appetite for the reader to dig deeper into the specific topics of interest. No subject is covered in any real depth, but that is not the intention of the writer. He successfully presents a comprehensive overview of various aspects of life in an America at war. I had really never paid much attention to the You Tube Internet website before, but I’ve recently been playing Veggie Tales video clips for my 2-year-old-grandson, who really likes Bob and Larry (they are a talking and singing tomato and a cucumber, respectively, for those of you unfamiliar with this wildly popular children’s series). I did a quick search on the “Civil War” and hundreds of video clips came up on You Tube. Narrowing the focus to “Gettysburg,” there were all kinds of selections, from clips from the 1993 Ron Maxwell movie to home-made junk of little value. Where to order my human interest stories books! Several people have written recently to ask me where they can purchase my three current Civil War book with human interest stories from Gettysburg and Antietam. They can be bought on-line from amazon.com for only $9.95 apiece. They can also be purchased on-site at a dozen locations in Gettysburg, including the Visitors Center bookstore, the Farnsworth House, the Gettysburg Gift Center, and other leading retailers. Volume 3 of Human Interest Stories from the Gettysburg Campaign is in progress, and I have it about half-way written. This may appear in 2009, although we have not set any timetable for its release. I have been devoting all my spare writing time to completing my lengthy manuscript (105,000 words) for A Spirit of Daring: The Louisiana Tigers in the Gettysburg Campaign. Osprey Publishing has sent me a copy of one of their latest releases, this one on the Sherman Firefly tank. The British army took delivery on hundreds of U.S.-built Sherman tanks and outfitted them with a massive 17-pound gun. This innovation finally allowed British forces to match up with the imposing german firepower that had dominated the Western European Theater of Operations for so long. 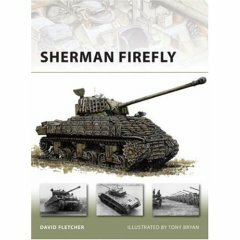 Veteran author David Fletcher, the historian at the Tank Museum in Bovington, UK, had penned an interesting and detailed account of the history of this conversion, exploring the people and methodology behind the development of the Firefly. Gamemasters Michael Mays and Curt Murff are going to put on two of the scenarios from the new Brothers Divided scenario book that Ivor Janci and I are collaborating on. This Gettysburg campaign scenario book should be in print later this year. Little Wars ’08 is being held from April 4-6, 2008, at the Marriott-Lincolnshire in Lincolnshire, IL (not far from Chicago). If any of you are attending that convention, why not stop by either game and take a crack at these original new scenarios? Back in my college days, I started board wargaming with my roommate, Charles Reace. We spent many memorable hours playing SPI and Avalon Hill games, among them one of my favorites, SPI’s Fast Carriers. Through the auspices of a Miami (Ohio) grad student named George Nafziger, we started into miniature gaming. George’s 25mm Napoleonic armies were very impressive. What are your favorite house rules for JR3??? 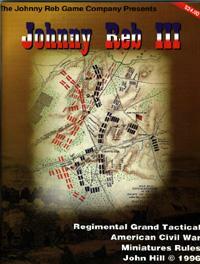 This year, 2008, marks the 25th anniversary of John Hill’s publication of the classic Johnny Reb rules set. The game system has underwent several iterations and changes; some good, some not so good. Over the years, several gamemasters have created their own side rules, variants, changes, and house rules, such as P.J. O’Neill’s alternate charge resolution. What are your favorite house rules that make JR gaming more fun for you and your friends? “The South had a general who could see, Stonewall Jackson. But Robert E. Lee was in charge of the army. This elemental fact decided the destiny of the South… Lee’s audacity might win battles, but the cost was going to be more than the South could bear.” Veteran Virginia author Bevin Alexander has written a thought-provoking and sure to be controversial book explaining the ways in which the Confederacy could have (and perhaps should have) achieved an early victory over the Union and secured its independence. How the South Could Have Won the Civil War: The Fatal Errors That Led to Confederate Defeat is published by Crown Publishers of New York, and is now available on amazon.com.